Foodies take note: Named the best food market in the world by National Geographic in 2012, St. Lawrence Market is a fantastic place to browse some of the best eats in the city, from fresh produce and artisan cheeses, to prepared foods, baked goods and meat. The market, which celebrated its 200th anniversary in 2003, is a Toronto institution, popular with both locals and visitors alike. If you’re curious about a visit and want to know what to expect when you go, follow this guide to one of the city’s best-loved attractions: St.
St. Lawrence market has been around for a long time and has taken several forms since its inception. Everything began in 1803, when Lt. Governor at the time, Peter Hunter, deemed that the land north of Front Street, west of Jarvis Street, south of King Street and east of Church Street would officially be known as the Market Block. This is when the first permanent farmer’s market was constructed. The original structure burned down in 1849 during the Great Fire of Toronto (which also devastated a good portion of the city) and a new building was constructed. Known as St. Lawrence Hall, this building played host to many city events, including lectures, meetings and exhibitions. The Hall and accompanying buildings went through several renovations and changes throughout the years that followed and the market was eventually demolished and rebuilt entirely in 1904 thanks to a population boom in the city in the late 1890s. St. Lawrence Market complex comprises three main buildings, which include the South Market, the North Market and St. Lawrence Hall. The main and lower levels of the South Market are where you’ll find over 120 specialty vendors selling everything from organic fruits and vegetables, to baked goods, spices, prepared foods, seafood and meats (just to name a few of the things you’ll find here). 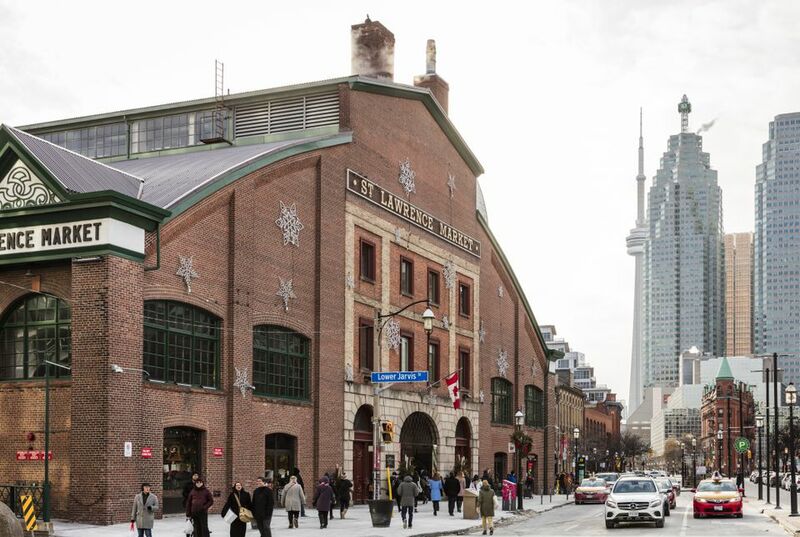 The second floor of the South Market is where you’ll find the Market Gallery, which houses rotating exhibits related to the art, culture and history of Toronto. The North Market is mainly known for the Saturday Farmers' Market, which has been happening since 1803 and is still going strong today. In 2008, the city of Toronto approved redevelopment of the historic site. As such, the Farmers' Market and the Sunday Antique Market have been moved to a temporary site. St. Lawrence Market is located at 92-95 Front St. East in the heart of downtown Toronto. Its temporary home is located at 125 The Esplanade, which is close to the original Market's South building. The market is open Tuesday to Thursday from 8 a.m. to 6 p.m., Friday from 8 a.m. to 7 p.m. and Saturday from 5 a.m. to 5 p.m. St. Lawrence Market is closed Sunday and Monday. The Antique Market runs from 7 a.m. to 4 p.m. on Sundays only. If you’re taking the TTC you can get to the market via King Subway Station. Once you get the station, take the 504 King streetcar east to Jarvis St, then walk south to The Esplanade. You can also get to the market from Union Station and then walking east about three blocks to The Esplanade. If you’ll be traveling by car, from the Gardiner Expressway, take the Jarvis or York/Yonge/Bay exit and head north to Front Street. You can find City of Toronto Green ‘P’ parking lots located behind the South Market Building, at Lower Jarvis Street and The Esplanade and in the parking garage on the east side of Lower Jarvis Street adjacent to the South Market, just below Front Street. The best way to visit St. Lawrence Market is by making sure to bring your appetite. No matter what you’re craving, you’re likely to find it here, whether you want to eat on site or take something delicious home for later. Check out some of the market’s must-eats below. Buster’s Sea Cove: If it’s fresh fish you’re after in the form of a fish sandwich or crispy fish and chips with a side of homemade slaw, this is the place to get it. They also have calamari, steamed mussels and more. Carousel Bakery: Visit Carousel Bakery, a market mainstay for over 30 years, for a taste of their world famous peameal bacon sandwich. People come from far and wide to try it so expect lineups on weekends, when the bakery can sell as many as 2600 sandwiches on a busy Saturday. St. Urbain Bagel: Crispy on the outside, dense and chewy on the inside, St. Urbain’s specialty are Montreal-style bagels. They were the first company to produce Montreal-style bagels in Toronto and they’re impossible to resist when still warm from the oven. Uno Mustachio: Uno Mustachio is the home of some seriously hearty Italian sandwiches, including their famous veal parmigiana, as well as eggplant, meatball with cheese, steak, sausage and chicken parmigiana. Cruda Café: Anyone in the mood for lighter, healthy fare should stop by Cruda Café, which serves up fresh, vegan, raw foods that are all gluten-free and made using ingredients that are as local as possible. Expect vibrant salads, raw wraps and tacos, juices and smoothies. Yianni’s Kitchen: Homemade Greek food is what’s on offer at Yianni’s Kitchen, which has been operating out of St. Lawrence Market since 2000. Stop by for pork or chicken souvlaki, Greek salad, moussaka, lamb stew and lemon chicken with rice. They’re also known for their apple fritters. Churrasco's: Chickens here are roasted on site daily in rotisserie ovens and basted with Churrasco’s secret hot sauce. Pick up a whole chicken to take home, or stop by for a chicken sandwich and some roast potatoes. European Delight: This family-run business has been at St. Lawrence Market since 1999 and specializes in homemade Eastern European dishes, including numerous varieties of pierogis and cabbage rolls. Aren’t We Sweet: Stop in at this stall for authentic French baked goods, including croissants, macarons, cookies and viennoiseries, as well as chocolates from France, Belgium and Switzerland. Kozlik’s Canadian Mustard: Established in 1948, this family-run business makes a wide array of handmade mustard in small batches, as well as seafood sauce, mustard powders and a meat rub. Try some before you buy from the many sample jars they have available to test. If you’re not in the market for prepared foods, preserves or baked goods, you can do your grocery shopping at St. Lawrence Market from the array of produce stands, cheese counters, butchers and fishmongers located throughout the market. In addition to food, the market is also home to various other vendors, craftspeople and artisans selling everything from handmade jewelery and clothing, to souvenirs and floral arrangements. In addition to the opportunity to talk to vendors about the food you’re buying, there’s more to St. Lawrence Market than the chance to buy and eat. The market also plays host to an ongoing roster of events throughout the year, such as cooking classes, culinary skills workshops, talks and dinners. The Market Kitchen is where these events take place and you can check the events page to see what’s going on and when. Many of the classes sell out so sign up early if anything catches your eye.